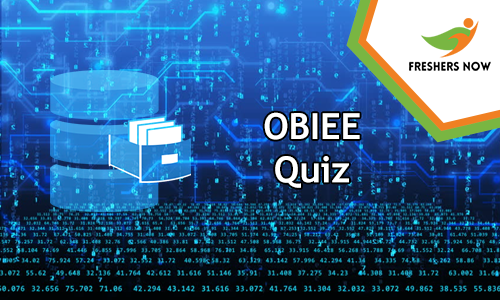 Individuals those who are eagerly waiting to take OBIEE Quiz can check this post entirely. In this article, students can practice the quiz to know OBIEE MCQ Questions. Also, we have provided some instructions that are available in the below sections. So, before attending the OBIEE MCQ Online Test aspirants can go throughout the page. Also, aspirants have to practice the quiz to learn more OBIEE Multiple Choice Questions and Answers. So, we advise all the students to take OBIEE Online Test to improve your skills and to know more other exciting details about the tool. So, before practicing the OBIEE Online Test, candidates can check the instruction that we are providing in this section. The quiz is composed of 26 questions. There is no time limit to finish the exam. Also, this is an Online Test test where the pattern is in the form of Multiple Choice Questions. Moreover, after completing your test applicants have to click on submit the test. Furthermore, we advise all the aspirants to keep visiting this article for more updates. Also, we suggest the candidates not to refresh the page in between the exam. 1. Which of the statements is true of a narrative view? 3. In OBIEE architecture, which of the following component is used to star and stop all components of BI system and is managed and controlled by Fusion Middleware Controller? 4. Which of the following would NOT be the best candidate for business intelligence tools such as Siebel Analytics? 6. Which CSS (cascading style sheet) influences the overall appearance of a dashboard’s main content area, including background color of dashboard page and page tab color? 7. Which of the following tasks can you perform in the Catalog Manager? 8. Which of the following is NOT true of the Intelligence Dashboards? 9. You would like to customize the text elements that appear in Siebel Answers, Siebel Delivers, and on dashboard pages. Which of the following would you use? 10. You would like to customize the text elements that appear in Siebel Answers, Siebel Delivers, and on dashboard pages. Which of the following would you use? 11. What parameter controls user session timeout? 12. Which of the Tools Utilities is not valid? 14. What can be used to customize the user interface in Siebel Analytics Web? 15. Which of the following tasks can you perform in the Catalog Manager? 16. Which of the following is NOT true of the Chart view? 17. Which of these is not Hierarchy type? 18. Which CSS (cascading style sheet) influences the overall appearance a of dashboard’s top section, including dashboard names and links? 19. Which view allows you to see results by being able to substitute one or more of the columns at runtime with other columns chosen beforehand? 20. Log messages can be verified from? 21. Which view allows you to see results by allowing you to change the view type at runtime? 22. Dimensions where data changes rapidly are known as? 23. Which of them is/are not Time Series Function? 24. To overcome changing dimensions performance issue, we must create? 25. Which of them is/are not OBIEE Services to be started? 26. Repository can be uploaded/ updated from? Oracle Business Intelligence Enterprise Edition is a Business Intelligence Tool by Oracle Corporation. And, when we come to the use of this tool, it is a proven architecture and common infrastructure to produce and deliver enterprise reports, scorecards, dashboards, ad-hoc analysis, and also rich end-user experience. OBIEE provides robust reporting which makes data more comfortable for business purpose. It gives the user with rich visualization, low cost, interactive dashboards, a vast range of animated charting options. Here are some key features. As a result of this taking the OBIEE Quiz, students can improve their time management skills, coding skills, learn how to solve a complex problem using simple queries, accuracy, speed, etc. Moreover, practicing many OBIEE MCQ Online Tests helps the aspirants to cover all the topics that are important for the exam. In addition to this, you become capable of answering the questions asked on Oracle Business Intelligence Enterprise Edition in the campus interviews. So, many contenders are worried about how to check OBIEE Programming Online Test Results. There is no point to worry here. We are providing you with the results as soon as you click on submit button. Hence, contenders can check their result on the page itself. Also, do not forget to click on Submit Test for offering your answers.